Chip Off the Ol' Block; best viewed in the larger sizes. Taken at the Denver Car Show. 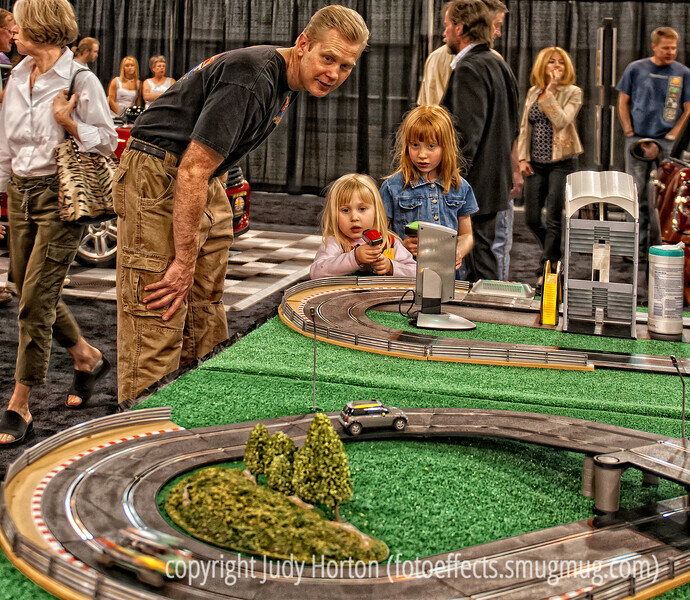 Daddy was proud-as-punch of his little one who was doing a great job racing the slot car. Thanks for your comments on my shot of the bubble up bottles at the World Market. Sure enjoyed perusing your creative and beautiful shots today. Did you all see the one of the hundreds (or more) Monarch butterflies all clustered together...really amazing! It was a gorgeous springy day here today. Hope you had an equally nice one. Love the expressions you've caught & your processing is superb (as always)!! Very nice scene and the capture of it - great pp too! Great shot, love the expressions on dad and the kids! This is a really great image. Terrific job!